In a reversal of last year's top two, Chris Newton proved that perseverance pays when he lifted the national 25-mile title on Sunday. AFTER finishing as the top British rider in the Prutour, Chris Newton switched to unpaced racing to win the RTTC National 25-mile Championship at Boroughbridge, North Yorkshire, on Sunday. The Linda McCartney RT rider turned in a course record 50-47 to beat Prutour stage winner and defending '25' champion Rob Hayles (Clarence Wheelers) by 23 seconds. 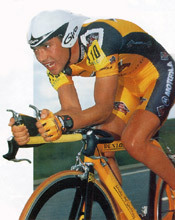 Stuart Dangerfield (Bio RT), the 1997 champion, again had to settle for third place and this time had to share the bronze medal with Newton's Linda McCartney team-mate Jon Clay, both on 51-54. Michael Hutchinson (Cambridge University CC), who six days earlier had set the season's fastest 48-53, came home in fifth place with 52-04, leading his fellow students Duncan Alexander and Stuart Lemanski to the team title - a first for a university team in an open national championship. With Alexander clocking 55-31 and Lemanski 55-44, Cambridge fended off the Harrods-Sixt team by just over a minute on aggregate. Newton, Hayles, Clay, Dangerfield and Hutchinson were all inside Harry Walker's 1997 record for the V230 course on the A168, a rolling singlecarriageway section of the old Great North Road running alongside the A1(M) motorway between Dishforth and Walshford. Among other Prutour riders competing in the title race, Julian Ramsbottom (Harrods) finished ninth in 53-42 and his team-mate and British Best All-Rounder Kevin Dawson took 14th place in 54-28. The championship was promoted by East Bradford CC, as part of their centenary celebrations, on behalf of the RTTC's Yorkshire District. The course provided a true championship test, on a well-surfaced road with very little traffic. The sun shone, but a stiff breeze from the north made the longest leg the hardest. Halfway times indicated the early pattern, with former hill-climb champion Jeff Wright (Team Travelwise), off number 11, the first to crack 27-00 with his 26-25. Unseeded Wright went on to finish with a time of 53-26, worth seventh place at the end of the day. Dominic Sweeney (Rockingham Forest Wheelers), seeded no 20, was 19 seconds down on Wright at half distance, but a strong finish saw the gap closed to eight seconds as Sweeney finished in 53-34 to slot in to a temporary second place. Former junior 10-mile champion and Prutour rider Matt Bottrill (Middridge CRT) was off the leader's pace, the mid-way check 2718 and his finishing 55-05 perhaps reflecting the efforts he has already made this season, starting with the Tour of Langkawi in January. Peter Smith (Border City Wheelers), winner of round one of the RTTC Time Trial Series, was out of luck this time, a puncture and a bent rim putting him out of the running after a 27-15 first half. With half the field finished, Wright still held the lead having seen off Neil Rothwell (Leo RC) - who recorded 54-22 on a 100-inch fixed gear - Ramsbottom and Dawson. 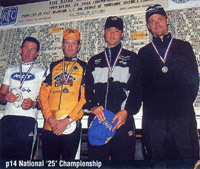 It was 10-mile championship silver medallist Michael Hutchinson, off number 75, who first shifted Wright. His halfway time put Hutchinson 39 seconds up on Wright, and by the Boroughbridge finish that had gone up to 1-22 as Hutchinson came home with 52-04 to head the listings. Jon Clay was on his way, and the Yorkshire all-rounder was five seconds up on the Cambridge University man as lie moved into the second half of his ride. Clay took another five seconds out of Hutchinson before the finish and moved into the lead on 51-54 with the top seeds still to come. BCF time trial champion Dangerfield, in his new Bio RT-MDT colours, was out on the road but he was five seconds adrift of Clay as went past the halfway timekeeper. Dangerfield dug deep and wiped out his deficit - but that was all, for in the end he dead-heated with Clay. Newton, former double champion Richard Prebble (Team Clean) and Hayles were still to finish. By now the wind had picked up and at Dishforth, the top of the course, rain threatened. 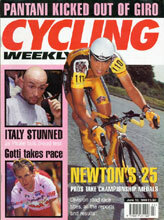 But the conditions left Newton untroubled, and his 25-10 halfway time put him 31 faster than Clay at that point. Prebble's 26-29 put him out of the picture, leaving Hayles to challenge Newton. A 25-16 opening half put him just six seconds behind the Stockton-on-Tees rider, with the hardest bit still to come. Newton, off 110, went to the top of the leaderboard with his 50-47. Hayles fought his way back as best he could, but could not match Newton's effort and the multi-track champion lost a further 17 seconds to run out with 51-10 for second place. Team.- Cambridge Univ CC (Michael Hutchinson, Duncan Alexander, Stuart Lemanski) 2-43-19. New champion Chris Newton had no trouble pulling a winning ride out of the bag, despite his recent efforts in the Prutour. "I came out of the Prutour going really well, he said. "For the last few years, I've usually ridden the `25' more or less straight after a stage race, and it never seems to do me any harm. This week I've just been doing an hour's intensive training every day on my low-profile time trial bike. I found it easy today. I rode at a steady rhythm, going through all the gears. I knew I would get in the results." Newton was pleased his father had been present to see him win: "It's the first time for some years that he has come to watch me. I'm having a bit of a rest now. I'm at home for about four weeks, and will be riding the Isle of Man Week, where I'm going for the BCF Time Trial Championship. I want to get selected for the World's time trial and would like to get a ride in the road championship."